The kitchen is the heart of every home. Everybody wants this room to be functional and convenient for use, and most importantly, adapted to personal needs. Everyone imagines this place in different ways. For many people, the kitchen is associated with beautiful old furniture made of wood which is the work of carpentry. After all, the sets of solid wood have their own unique amazing atmosphere and history which is difficult to find in modern lacquered kitchens. 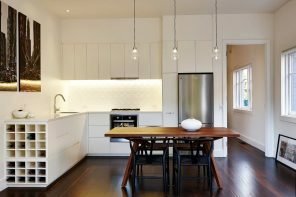 We have gathered some of the topical solid wood kitchen stylish ideas for modern interiors which are applicable in white range of houses and apartments. Bespoke kitchens from solid wood mean exceptional elasticity, unique style and long durability, due to which the furniture will last for many years. Cabinets made of noble wood give the rooms a cozy character and emphasize internal prestige. Traditionally, wooden furniture in the kitchen is associated with a rustic interior, but today they make a lot of designs for modern design. Advice! Wooden furniture for the kitchen should be properly used and protected from the putting of hot dishes on it. Thus, the surfaces will avoid discoloration which can occur under the influence of heat. Oak kitchen furniture is one of the most popular and at the same time most expensive offers. Kitchens from solid oak have been used for many years, representing elegant headsets, providing a beautiful effect, highlighted by special granularity and wood coloring. The popularity of this material allows you to choose from a wide range of designs and colors of this type of furniture. Rigid oak construction means the kitchen set will be very resistant to mechanical damage, deformation and dirt. Oak wood will not begin to deform after a few years, it will withstand impacts, falls and occasional scratches. In addition, it is relatively easy to take care of oak kitchen furniture. It is worth noting that the solid oak timber has a kind of natural color, which is perfectly combined with modern and traditional interior styles. Advice! An oak wood acquires a noble appearance over time, but protect furniture from direct sunlight and a heat source. Facades for Solid Wood Kitchen: Where to Start? Kitchen from solid wood in accordance with the assumptions of the chosen design has a unique character, high, noble aesthetics and durable look. The traditional interior of the wooden kitchen is preserved in the rustic concept. Beautiful, decorative facades of kitchen cabinets, classic handles and rich accessories highlight the unique character of the elegant kitchen. The working wall can be lined with ceramic tiles, which in fact is extremely functional, because it is easy to clean. The solid wood is elegantly combined in innovative kitchen appliances with silver surfaces. Modern kitchens look great, combining raw, simple furniture with the latest trends in interior design. Minimalism, naturalness and high quality are the main preferences. Wooden kitchen furniture can be both light and dark, treated with a thin layer of varnish. Advice! Having wooden kitchen furniture, you must protect it from moisture if you want it to last for many years. A beautiful kitchen made from natural wood can be decorated in a rustic style. 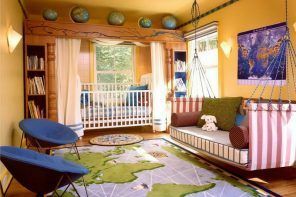 The entire layout of the room looks very idyllic, cozy, and homely. Wood is an excellent material, thanks to which the interior completely changes its character. It looks warmer and more comfortable. This room is a functional space which has a unique atmosphere and character. Unusual, minimalist kitchen of solid wood will be perfectly combined with a brick wall, pointing to the industrial style in the interior. The stylish design looks great thanks to a combination of two completely different materials, acquiring an industrial character. If there is exposed concrete, then it is in perfect harmony with the warm color of the wood, which ultimately leads to the creation of a very modern but cozy home interior in the kitchen space. If you want to observe a combination of two styles in your kitchen – modern and classic – then place the facades of solid wood and laminated surfaces of MDF. Their combination looks quite harmonious. Such a kitchen will be framed in a modern minimal style, which is very crude in shape. The main emphasis in the kitchen will be directed to the contrast between the wood and the painted part of the cabinets. What do you get by combining wooden kitchen cabinets with colored facades? Comfortable, warm kitchen, in which there is an amazing pleasant atmosphere. To emphasize the cozy character of the room, the interior can be decorated with original accessories. A small solid wood kitchen is a good idea in a block of flats. In addition, to give it an original look and emphasize the modern character of the interior, you can choose a light gray or white countertop. 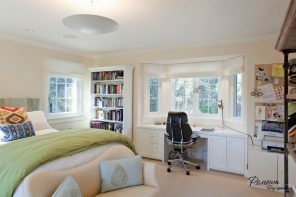 Thanks to this, the light in the room is reflected, causing the room to appear optically large. It is a very effective trick, especially useful in small confined spaces without access to windows. Kitchens from solid wood represent a luxury that will delight you for many years, emphasizing the prestige of the house and the good taste of the owners. Today, wood is not a synonym for classics, since in this material you can increasingly find kitchen sets in the Art Nouveau style. 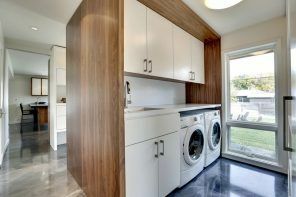 Check out the photo gallery, which will please with its vast offer of chic kitchens from solid wood.